Just listed in Boca Raton, Florida within the luxury townhome community of Trieste at Boca is this this fabulous tri-level townhome. Set across 3 levels, all of which are accessible by elevator, this Trieste at Boca residence encompasses more than 2,900 square feet of living space with 4 bedroom, 3 full bathrooms, 2 half bathrooms and a bonus room. Upon entering the first level, you’re greeted a fabulous 2-story foyer, powder room and bonus room that could easily be converted to a media room, den or office. The heart of this spectacular townhome, the second level offers two balconies, a combined living and dining area and a spacious kitchen with separate breakfast area. The third level is devoted solely to rest and relaxation and is home two guest rooms, a sizable Master Suite with dual walk-in closets and a beautifully appointed Master bath. Outdoors you’ll find a private backyard with covered lanai, brick paver patio and meticulously landscaped backyard. Additional features include plantation shutters, closet built-ins, impact windows and doors two-zone A/C system, a tankless gas water heater and a 2-car garage. 5765 Ne Verde Circle is located in Boca Raton and is currently asking $599,000. 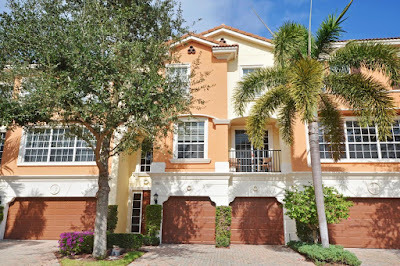 This Trieste at Boca listing is courtesy of MLS# RX-10149753. Trieste at Boca is an exclusive townhome community situated in the seaside city of Boca Raton, Florida. Residents of this luxurious Boca Raton community indulge in an impressive amenity package including of this highly desirable community enjoy access to a number of resort-style amenities including manned gated entry, lushly landscaped park-like grounds with walking paths and a beautiful resort-style pool. Residents also enjoy a premier Boca Raton location just minutes away from Royal Palm Plaza, Mizner Park and the beach. I-95 and Florida’s Turnpike are also just a short drive away.